I once accompanied a high school choir at their own version of the Music Artistry Program. Since pianists don’t carry around their own instrument, we all learn how to adjust in the moment to each piano we play and create as beautiful of a sound as possible. The only downside to this is that it doesn’t encourage proper care of a piano because to the untrained ear, people think the piano is great when in reality, it isn’t fun to play. Over the years I have played some incredible pianos that did everything I wanted, and I’ve played my share of terrible pianos where keys and pedals didn’t work and were significantly out of tune. At this particular choir event, I played a short upright in the warm-up room, followed by a 9-foot concert grand Steinway in the concert hall, followed by 5-foot grand in the room where the judge worked with the choir. The short upright had unusual dimensions. The music rack sat over the keyboard, so if my hands went up, they would hit it. It was also a shallow piano, so I couldn’t move the music rack away from me where it would be easier to read. I sat as far away from the piano as possible just to compensate for it. It took extra work to play that piano. When we moved on to the concert hall with the 9-ft Steinway, the dimensions of the piano were great. I could move the music rack away from me; the bench was easily adjustable, and the tone of the piano was exquisite. It was a joy to play that piano. When we moved to the room where the judge worked with the choir, the 5-ft grand piano in that room played well, and I could move that music rack away from me. However, when I looked at the keyboard itself, I was surprised to find an extra 1/4 inch of space after the key should have ended at the fallboard. Don’t anyone with long fingers accidently get stuck in there! Three different pianos in the space of an hour, and only one of them would I go back and play for fun. A piano that is fun to play keeps pianists coming back for more. 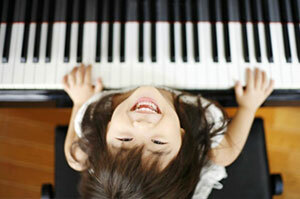 When looking for your own piano, find the best piano you can afford, and watch your skills, confidence and fun soar. Do not underestimate the value of choosing a quality instrument for your child to practice on. It is an investment that will give back exactly what you put into it. If you are thinking about piano lessons, we’d love to help. Call us at 360-527-9626. We also help all of our students find a suitable piano. Click here for tips on buying a piano. We look forward to hearing from you. Earlier this summer I was shopping and met a 20 year-old sales clerk who discovered that I taught piano. While he admired his favorite musicians on the radio, he had never studied any musical instruments himself, nor had he ever spoken with a real life musician before. I learned that he thought that all professional musicians were perfect and never made mistakes. I took the opportunity to give him a reality check. Guess what? Even Michael Jackson made mistakes. When I told him that, he was completely shocked. Here was someone he admired, and he thought was perfect. The truth, however, was Michael Jackson was a human, and humans do make mistakes, especially when they are learning. I also clarified that Michael Jackson prepared his music so well, and knew it so well, that he didn’t make that many mistakes in performances, but when he did, he knew how to keep going and not draw attention to it. Was Michael Jackson immune from making mistakes? No. This sales clerk was in disbelief. I took it a step further. If Michael Jackson was still alive, you could ask him, “Tell me the worst public mistakes you’ve ever made.” And, he would be able to tell you. I think I blew this young sales clerk’s mind that day. But also, I was hoping to open the door of possibility of his own potential. These people that you admire and are older than you, they are also just like you. They also had to start in the same place you started. Guess what you have in common? You are both human. And what is the one universal requirement for playing a musical instrument? A human body. It’s easy to admire our favorite musicians from afar, no matter the style of music they play or sing, and forget that they are simply a human being who put time, energy and focus into refining their craft. That same time, energy and focus is available to all of us to choose where we want to spend it. We are fortunate to have so many opportunities available to us. The question everyone gets it answer for themselves is where do you want to spend your time, energy and focus? If you’d like to spend yours learning how to play the piano, or taking your playing to the next level, give us a call at 360-527-9626. We’d love to help reach your dreams. 2016 was the year of spectacular phrasing. Just what is phrasing? It is listening to the sound you create and deciding how you want each note and groups of notes to sound. Do you want them to start quietly and then grow to a really big sound? Or do you want to start loud and end quietly. Will the sound be harsh and abrasive? Or will it be gentle and inviting. The possibilities are endless. The question musicians ask themselves to help them decide how to phrase is: What is the music trying to communicate? There is an example of a Prokofiev Sonata where parts of it can be phrased with no loud, no soft, no crescendo, no nothing but monotone big sound. Why would Prokofiev write a piece like that? A little history provides the answer. He was living in the Soviet Union in the 1930s where there was no freedom. He was describing what it felt like not to be free. (What I find fascinating is that he wasn’t thrown in jail). Contrast that with a brilliant Chopin Polonaise where huge dynamic contrasts bring the piece alive. Professional musicians meticulously choose how they want every single note to sound. Sometimes they don’t know what way will sound the best. So they experiment and let their ears and body tell them. Keeping in mind what the piece is about, they listen closely as they try different ways. When they find the way that moves them and conveys the feeling the piece is trying to convey, that seals the deal. You too can learn spectacular phrasing right now. You don’t have to wait until you’re a professional musician. All it takes is a listening ear and a willingness to explore different sounds. If you’re not sure where to start, ask your teacher for help. Before you know it, you’ll be playing music that not only moves your audience, but also moves you as well. How do you know when a piece is too hard? Learning to play the piano can be rewarding and challenging. Finding just the right pace for a student, not too easy, and not too hard, is the key to their continued success. Overcoming challenges incrementally will build their confidence. When your child is confident, they are more open to learning and trying new things. And when they are open to learning, learning accelerates. I recently had a student discover on her own how to know when a piece is too hard or just right for her. When she’s learning something new, if it’s just the right level of difficulty, she can master it in about 2-4 tries. When it takes more than five tries, and even then she’s not really getting it, then she knows it’s too hard for her. It made my day when she came to her lesson one day and announced that a piece I had given her the week before was too hard. The feedback from her helped me determine a more appropriate course of action for her lessons. Several months from now when she has more skills, we can revisit that piece, and perhaps it will be just the right amount of challenge where she can get it in 2-4 tries. Each student’s pace of learning is unique to them. Teaching them self-awareness so they can be actively involved in their own learning process will enhance their learning and develop independence. When a student is invested in their own learning, the sky really is the limit on what they can accomplish. I recently talked with an acquaintance who had taken a few years of lessons as a child, and now as an adult was spending his spare time playing the piano again. Between juggling kids and work it was difficult to find a consistent time to practice. We then went on to a discussion of what does practice look like so that your brain does remember. 1. Visit the piano once a day, even if it’s only for five minutes. In those five minutes, teach yourself one new thing, no matter how tiny. The next day, review that one new thing. If you have time, teach yourself another new thing. Keep repeating this process every day until you have taught yourself the entire piece. 2. Get a good night’s sleep. Any time you learn something new, the next two nights of sleep your brain will finish processing what you learned. When you are able to practice several days in a row, every night you are processing what you learned that day and the day before. If you or your child can identify with your brain not remembering what you previously practiced, try these two ideas and see what happens. I’d love to hear what you learn.